Thunder Products offers Custom Foot Boards made of Billet 6061-T6 Aluminum. In other words, high end materials! Top and Bottom finishes are offered in mix & match chrome, black and contrast cut. 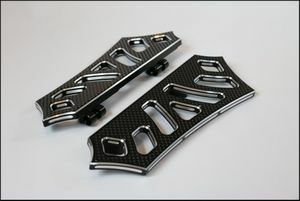 Matching Passenger Boards are available.